Inherent Sustainability Drives Powder Metallurgy Market to Surpass $10 billion by 2023 - Market Report (2017-2023) by Industry Experts, Inc.
Industry Experts, Inc. unveiled the new global market report entitled "Powder Metallurgy – A Global Market Overview". As per the new report, Automotive forms the largest, as also the fastest growing, application for Powder Metallurgy, the market for which is slated to compound annually at 6.5% over 2017-2023 in reaching a projected US$7.8 billion by 2023. Powder Metallurgy is a technique used for processing powdered feedstock that is further used to manufacture various types of components. The parts and components produced using this method find application in a range of areas, such as aerospace, automotive, business machines, electrical & electronics and industrial, among others. These components can include gears, bushes, bearings, sprockets, rotors and magnets. 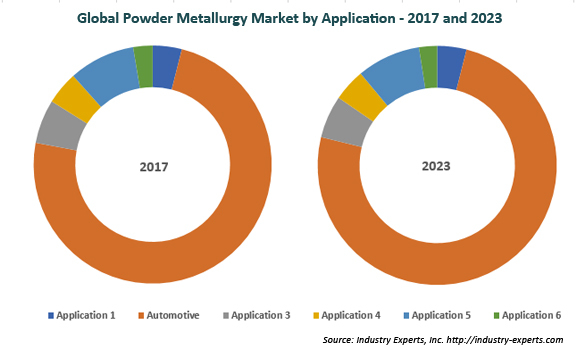 Fast growth in technological advancements in electronic and computer components is one major factor fueling demand for Powder Metallurgy, with the aerospace and automotive industries also making significant contributions. North America is the largest global market for Powder Metallurgy, estimated at US$2.6 billion in 2017 while Asia-Pacific is slated to register the fastest growth for the analysis period 2017-2023. The report explores the Powder Metallurgy market for the period 2014-2023 globally, and the regional for metal types including Ferrous and Non-Ferrous while Non-Ferrous Metals further dig down by sub-segments Aluminum, Cobalt, Copper, Nickel, Titanium and Others. The study also analyzes the major applications of Powder Metallurgy including Aerospace, Automotive, Business Machines, Electrical & Electronics, Industrial and Others. The report reviews, analyses and projects the Powder Metallurgy market for global and the regional markets including the North America, Europe, Asia-Pacific, South America and Rest of World for the period 2014-2023 in terms of value in USD. The regional markets further analyzed for 15 independent countries across North America – The United States, Canada and Mexico; Europe – France, Germany, Italy, Russia, Spain and The United Kingdom; Asia-Pacific – China, India, Japan and South Korea; and South America – Argentina and Brazil. This global Powder Metallurgy market report includes 209 charts (includes a data table and graphical representation for each table), supported with a meaningful and easy to understand graphical presentation, of the market. This report profiles 24 key global players and 43 major players across the North America – 20; Europe – 16; and Asia-Pacific – 7. The report also provides the listing of the companies engaged in the global Powder Metallurgy industry. The global list of companies covers addresses, contact numbers and the website addresses of 208 companies.